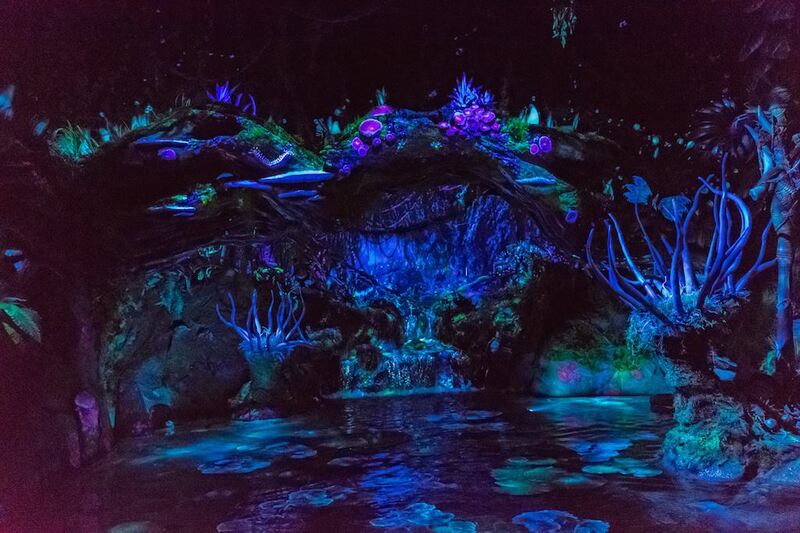 The Na’vi River Journey is a 4½-minute boat ride through the Pandora jungle. You begin by boarding one of two small, hewn rafts joined together. Each raft has two rows of seats, and each row comfortably fits three adults. That might seem small, but it’s more likely a nod to authenticity – the Na’vi are unlikely to have invented technology like fiberglass to make larger vessels as in, say, "it’s a small world". 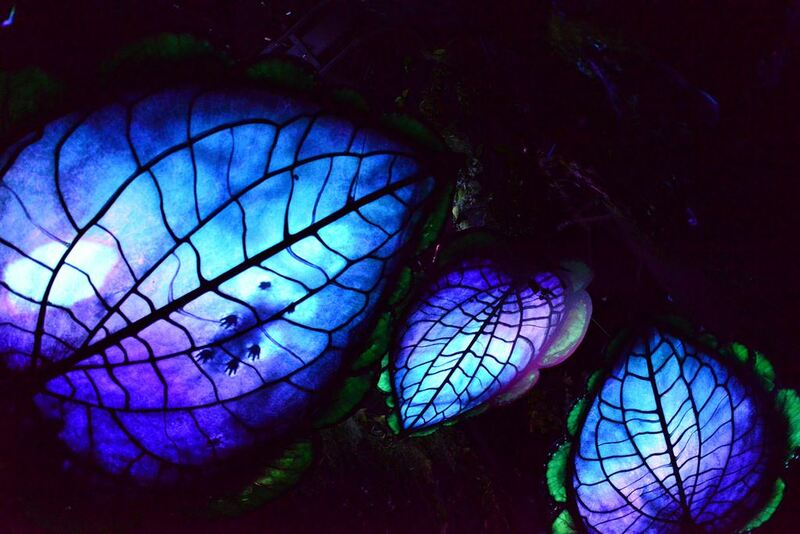 Off you go into the nighttime jungle, past glowing plants and exotic animals. 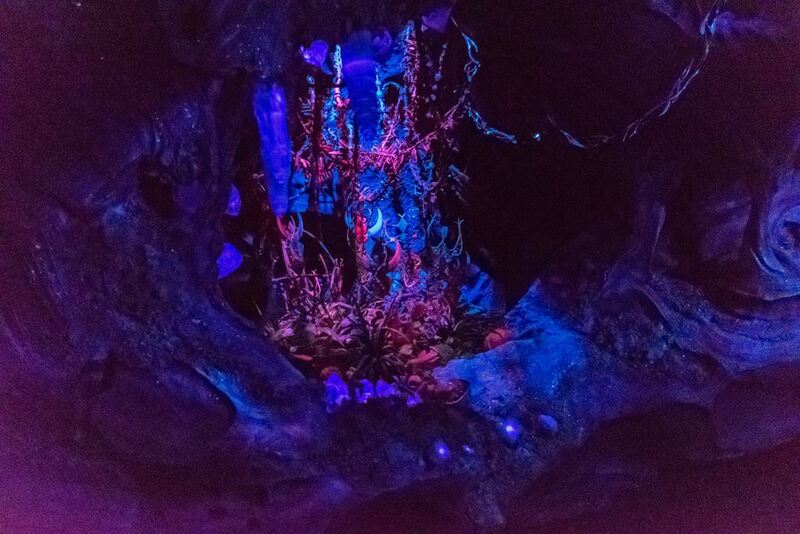 To create these, Disney has used traditional, three-dimensional sets for the flora, coupled with video screens showing the movement of the fauna. Escape from Gringotts, the one ride at Diagon Alley, uses video screens for its action, too. But here again Disney has done Diagon Alley one better – the screens directly in front of you in Na’vi River Journey are semi-transparent, so you can see past them. And what’s past them are more screens, with background scenes that also move. That means you’re seeing action in the foreground and background simultaneously, all surrounded by densely packed landscaping. Another bit of technology put to great effect is video projection mapping like that used in the Magic Kingdom’s nighttime show Happily Ever After. Here it’s used to project three-dimensional bugs crawling on tree trunks in one of the ride’s middle scenes. The ride’s big star, however, is the Shaman of Songs, displayed in the ride’s culminating scene. 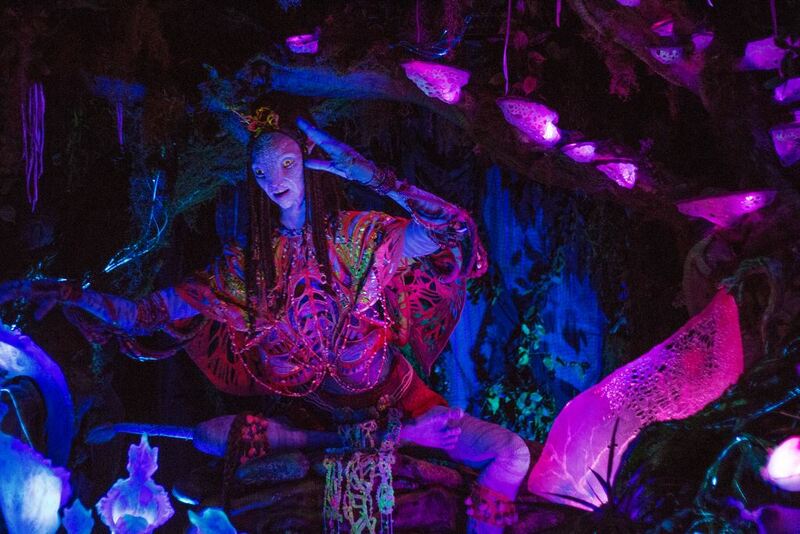 This shaman is easily Disney’s most life-like animatronic ever created. Its arms move with such grace that the only reason to suspect it’s a robot is because you don’t know any real people who’re that coordinated. (Disney has a history of building advanced but somewhat unmaintainable animatronics for the Animal Kingdom. Expedition Everest’s Yeti was built in a way that repairs to it require much of the surrounding ride’s infrastructure to be removed. The Yeti hasn’t run properly in almost a decade. We’ll give River Journey an extra half-star next year if the shaman stays running.) Yet another nice touch is that the shaman’s voice is off-pitch; Disney didn’t make it sound like a professional singer. Despite that, there’s enough to see in Na’vi River Journey that it’s worth re-riding. Disney seems to think that lines will not be too long once the initial opening hype dies down – the queue for the ride doesn’t seem built to handle massive crowds. We’d ride it again if the waits are 20 minutes or less. Na’vi River Journey offers FastPass+, but we don’t yet think it’s a good use. You can't get a FastPass+ for both this and Flight of Passage, and Flight of Passage is a better use. If you can't get Flight of Passage, however, Na'vi River Journey is a good backup because it still gets long lines--mostly people that balk at the exceptionally long lines for it's Pandora neighbor. This chart shows you roughly how long you'll wait for Na'vi River Journey when you visit on a day with a given Disney's Animal Kingdom Crowd Level. The blue bars represent the average "peak" wait time (that is, how long the line will be at its busiest). The bottom and top black lines represent the range of peak wait times to expect (for you fellow nerds out there: it's the 5th percentile and 95th percentile of peak wait times). Please note that these are estimates, and for a better forecast for your travel dates, see Na'vi River Journey Wait Times. 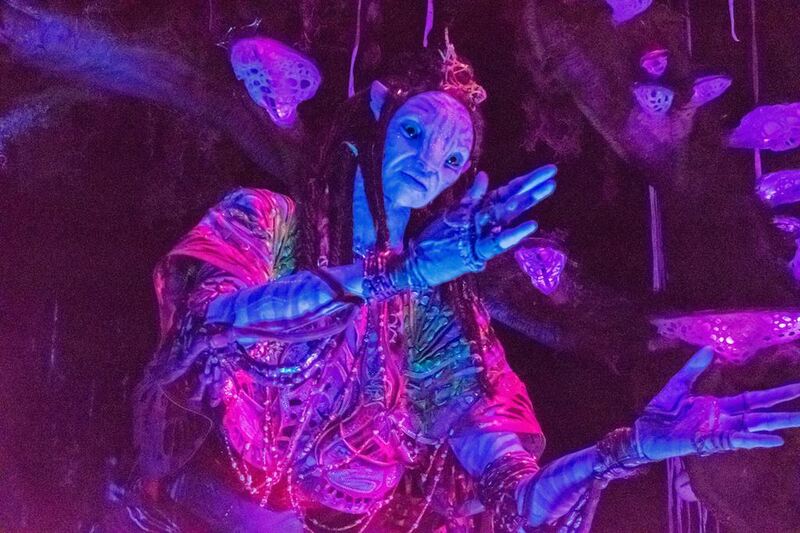 Na'vi River Journey and Avatar Flight of Passage are both in a "choose only 1" FastPass+ tier, so for now you will only be able to reserve FastPass+ for one of the attractions in Pandora.